Adhering to both standards and the emergent curriculum is tough. As I discussed yesterday, it’s clear that mastery learning practices lead to an increase student achievement, but as knowledgeable educators, we also know that we want our students to find themselves in the curriculum, and that cannot be achieved with a one-size-fits-all curriculum. But how do we achieve that? How do we help our students find their individual passions and interests in a standardized curriculum? You achieve this by giving the kids some major responsibility. It’s scary, I know, but you can do it. The key to giving kids responsibility is having a firm understanding of what your role is as the educator in the classroom, so that you can empower the children to take charge of all the responsibilities that belong to them. By providing the frame for a unit or learning experience, you allow your students the luxury of structure, which they so desperately need; meanwhile, placing the task of shaping the curriculum within the students’ realm of responsibilities allows the students to find their own individuality and creativity within that frame. Think of it like teaching students to write, draw, or sculpt. In each of these abstract practices, we provide a structure to help students see the big picture, all the while encouraging them to manipulate or shape the frame so that it will work for their needs and interests. 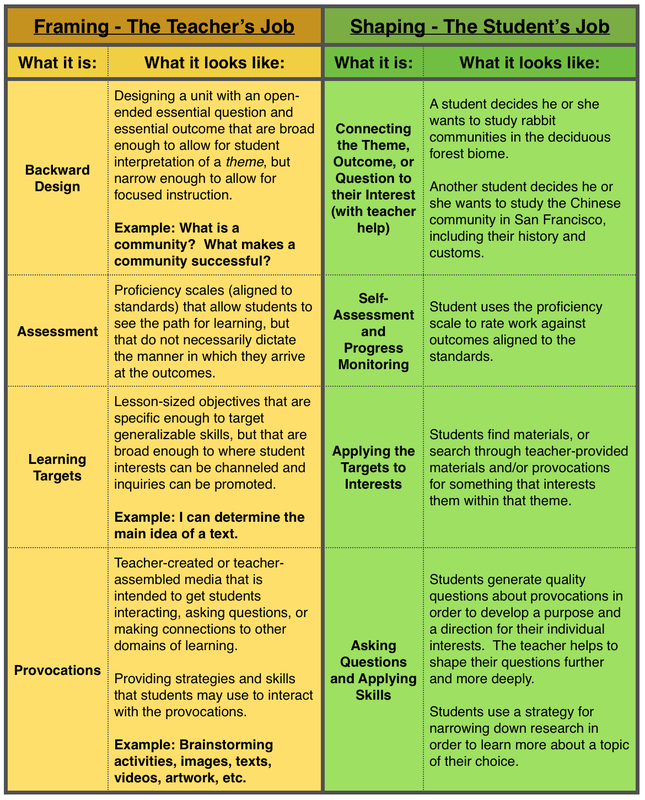 See the chart below for some of the parallel practices of framing curriculum and shaping lessons. I know, it’s hard to envision what these strategies and tools might look like when they come to life. So tomorrow, check out “Inspiring Independence: Helping Kids Help Themselves,” and see how I achieved this with a group of fourth- and fifth-graders over the past two years.